Press Out and Decorate: Unicorns is published and very kindly sent to me to review by Nosy Crow. This book is aimed at children but actually, it’s ideal for anyone who’s young at heart and I really enjoyed colouring my unicorn and rainbow ready for the review. This book is hardback, a little larger than A5 and spiral-bound. The covers are deep blue and the spine is rainbow with pink foiling on the spine and the front cover. On the inside covers are white line drawings on an orange background of some of the decorations assembled and made into mobiles and garlands. The book contains 20 different shaped decorations relating to unicorns and weather, some of which are flat and some of which slot together to make a 3D shape, all of which you can press out (before or after colouring), colour and assemble and then hang around the house or create a mobile or garland with. The pages are made of very thick card/hardboard and are covered in pink foil throughout. The decorations are white with pink line-drawn patterns all over them which you colour within and these catch the light beautifully when you hang up your assembled decoration and it moves against the light. The decorations are printed double-sided with the same design on both sides so that you can colour it identically and have a 3D decoration at the end. The cuts around the little sections that need to be removed in order to slot the shapes together and hang them up are really well cut so that you can push the unneeded bits out with your fingers or something a bit pointier if needed. The pieces slot together really well and are very sturdy and will remain so if you don’t disassemble and reassemble them a lot so they won’t fall apart by accident and they shouldn’t need gluing. Each decoration has small holes that you can tie some thread through (the holes are a little small for string) and you could either hang the decorations separately or together, or even create a mobile or garland with. If you don’t want to keep these decorations up all year round then they can be disassembled and the pieces can be popped back into the guides in the book for safekeeping. The guides can also be used as stencils to draw within (or you could draw around the pieces but be careful to only use pencil so you don’t accidentally damage your finished piece) so that you can create lots more decorations than the original 20 you’re getting. Simply draw within the slots and holes on the pieces to make sure it’ll slot together just like the original or, if you’re using thinner card, make them thinner and adjust with scissors as you go if it’s a bit too tight a fit! The decorations are in a number of different sizes and are a mixture of 3D and flat with 13 being 3D once slotted together. Once they’re all coloured, assembled, and displayed together they’ll look fabulous and you’ll have created your own unicorn-tastic room! The decorations are a variety of things from winged unicorns to shooting stars, rainbows, clouds and lightning bolts, a number of the shapes also have pictures of unicorns and rainbows on them so you’re getting plenty of unicorns throughout the book! As mentioned before, the card is very thick hardboard and therefore you can use whatever mediums you fancy. I used alcohol markers on mine as they’re much more fade-resistant than water-based pens and they didn’t shadow at all. The patterns are quite detailed so you may struggle with pencils and little people almost certainly would so I’d stick to pens for this (do put down some protective stuff on the table if letting your child loose with Sharpies or it may not just be the decoration that gets permanently subjected to their creative flair). These decorations would make a perfect family project, you could do one each or even do a piece each and see what you come out with, I’m sure you could create some really wonderful decorations that would be treasured for years to come! It would be a lovely activity to do for or with your children and once you’ve completed all of them, or just a few, you could hang them around the house or on your child’s bedroom in pride of place so that you and they are constantly reminded of the fun you had creating them together. The hardboard is really durable and will hold up to a fair bit of bashing, scrubbing, and over-colouring (children can get a little over-enthusiastic with pens sometimes) so these decorations would be ideal for children of almost any age, if they can hold a pen and colour, they can colour these decorations! The parts are all fairly big so it’s advised on the book that you don’t give it to a child under the age of 36 months but above that you’ll be good to go! In terms of mental health, what could be better than an activity that you can share with your children? The process of colouring them together will be sure to lift your mood and if you’re ever having a bad day or feeling anxious, go and check out your handiwork and marvel at the gorgeous colours you chose! The intricacy and detail level is surprisingly high for a book that’s aimed at children and is higher than the previous titles in the series with a few of the pieces having really very intricate, small sections which you may struggle to colour within, however, the pink lines can either be coloured within or over, it really won’t matter either way and you’ll get some very unique unicorn decorations regardless of the way you colour them. Each decoration has unicorn or weather-themed imagery on it including winged and un-winged unicorns, rain, clouds, rainbows, suns, and flowery patterns, you could use any colour scheme you fancy and tailor it to a specific room’s colour scheme or just let loose with ALL the colours! Each decoration is either made of one or two pieces so some need no assembly and those that do just require slotting one piece into the other so they’re really easy to assemble and they don’t take hours and hours to colour, even if you do colour each section separately (like I did) so they’re a great quick project to create something beautiful and displayable for your home! I would highly recommend this book to those with children, or the young at heart. These unicorn decorations are super cute and great fun to colour and they look even better once assembled, a fully coloured set will look wonderful hung up in a room and they’ll be sure to delight your child and brighten up the darkest of days, be those due to weather or mental health. 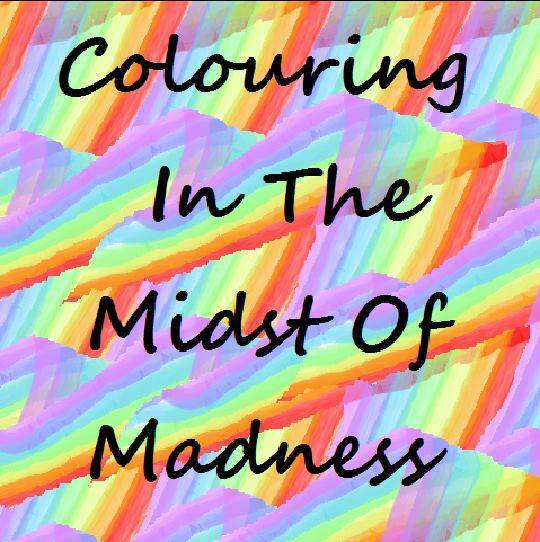 Get colouring yourself some fabulous decorations and fill your world with unicorns and rainbows! You can see my silent video flick-through of the whole book here. The decorations below were coloured using Bic Marking Alcohol Markers. Press Out and Colour: Christmas Decorations, is published and very kindly sent to me to review by Nosy Crow. This book is aimed at children but actually, it’s ideal for anyone who’s young at heart and I really enjoyed colouring my Christmas Decorations (so much so that I did two) ready for the review. This book is hardback, a little larger than A5 and spiral-bound. The covers are dark green and the spine is red with gold foiling on the spine and the front cover. On the inside covers are white line drawings on a red background of Christmas decorations hung on tree branches. The book contains 20 different shapes of Christmas decorations, some of which are flat and some of which slot together to make a 3D shape all of which you can press out (before or after colouring), colour and assemble and then hang around the house or on your Christmas tree. The pages are made of very thick card/hardboard and are covered in gold foil throughout. The decorations are white with gold line-drawn patterns all over them which you colour within and these catch the light beautifully when you hang up your assembled decoration and it moves against the light. The decorations are printed double-sided with the same design on both sides so that you can colour it identically and have a 3D decoration at the end. The cuts around the little sections that need to be removed in order to slot the shapes together and hang them up are really well cut so that you can push the unneeded bits out with your fingers or something a bit pointier if needed. The pieces slot together really well and are very sturdy and will remain so if you don’t disassemble and reassemble them a lot so they won’t fall apart by accident and they shouldn’t need gluing. Each decoration has small holes that you can tie some thread through (the holes are a little small for string) and you could either hang the decorations separately or together, or even on your Christmas tree. You may not want to keep these Christmas decorations up all year round and if that’s the case then they can be disassembled and the pieces can be popped back into the guides in the book for safekeeping. The guides can also be used as stencils to draw within (or you could draw around the pieces but be careful to only use pencil so you don’t accidentally damage your finished piece) so that you can create lots more decorations than the original 20 you’re getting. Simply draw within the slots and holes on the pieces to make sure it’ll slot together just like the original or, if you’re using thinner card, make them thinner and adjust with scissors as you go if it’s a bit too tight a fit! The decorations are in a number of different sizes and are a mixture of 3D and flat with 11 being 3D once slotted together and 9 being flat. Once they’re all coloured, assembled, and displayed together they’ll look fabulous and you’ll be all set for the arrival of Christmas and all its festivities. They are in a variety of shapes including a candy cane, Christmas pudding, nutcracker, heart, bauble, Russian dolls in three sizes, a donkey, snowflake, Christmas tree and circular. As mentioned before, the card is very thick hardboard and therefore you can use whatever mediums you fancy. I used alcohol markers on mine as they’re much more fade-resistant than water-based pens and they didn’t shadow at all. The patterns are quite detailed so you may struggle with pencils and little people almost certainly would so I’d stick to pens for this (do put down some protective stuff on the table if letting your child loose with Sharpies or it may not just be the decoration that gets permanently subjected to their creative flair). These Christmas decorations would make a perfect family project, you could do one each or even do a piece each and see what you come out with, I’m sure you could create some really wonderful decorations that would be treasured for years to come! It would be a lovely activity to do for or with your children and once you’ve completed all 20, or just a few, you could hang them around the house or on your Christmas tree in pride of place so that you and they are constantly reminded of the fun you had creating them together. The hardboard is really durable and will hold up to a fair bit of bashing, scrubbing, and over-colouring (children can get a little over-enthusiastic with pens sometimes) so these decorations would be ideal for children of almost any age, if they can hold a pen and colour, they can colour these decorations! The parts are all fairly big so it’s advised on the book that you don’t give it to a child under the age of 36 months but above that you’ll be good to go! In terms of mental health, what could be better than an activity that you can share with your children? The process of colouring them together will be sure to lift your mood and if you’re ever having a bad day or feeling anxious, go and check out your handiwork and marvel at the gorgeous colours and look forward to the presents and food you’ll be sharing with each other soon! The intricacy and detail level is surprisingly high for a book that’s aimed at children but the gold lines can either be coloured within by adults, or over by children, it really won’t matter either way and you’ll get some very unique Christmas decorations regardless of the way you colour them. Each decoration has Christmas-themed imagery on it including presents, snowflakes and festive birds so none of it needs to be coloured realistically and you could either theme them all with a Christmassy palette or just let loose with ALL the colours! Each decoration is either made of one or two pieces so some need no assembly and those that do just require slotting one piece into the other so they’re really easy to assemble and they don’t take hours and hours to colour, even if you do colour each section separately (like I did) so they’re a great quick project to create something beautiful and displayable for your home! I would highly recommend this book to those with children, or the young at heart. These Christmas decorations are super cute and great fun to colour and they look even better once assembled, a fully coloured set will look wonderful hung up in a room or adorning a Christmas tree and they’ll be sure to delight your child and brighten up the darkest of days be those due to weather or mental health. Get colouring yourself some fabulous decorations and get into the Christmas spirit early this year! Droomreis Kleurboek is published and kindly sent to me to review by BBNC Utigevers. This book is illustrated by Maria Trolle and was originally published in Sweden by Printworks with the title Vivi Söker en Vän (Vivi’s looking for a friend), as many of you will already know this book was originally published as a full colour children’s book with an accompanying story (read the quote below from Maria herself describing the story and purpose of the book) and Maria created a colouring book of the uncoloured illustrations, this new Dutch version has the same beautiful images but quite a different publication format so read on to find out about the book itself and the similarities and differences between it and the Swedish edition. “The story of the book in short is this: “When Vivi woke at dawn the walls were darker than usual and the house felt cramped. I want a friend, someone who is just mine, she thought. Vivi lives in a tree house in the woods. One day she goes on an adventure to find herself a friend. The book itself is 21.7 x 25.6cm, it’s hardback with a partially coloured image from inside on the cover and a black and white illustration on the back cover, also from inside the book with gold foil on Vivi’s dress. The spine is glue and string bound and attached to tape within the hardback binding so it’s very durable but a little tricky to get the book to lie flat and reach the very edge of the image in the gutter. The majority of the pages are printed single-sided and aren’t perforated, five of the pages span onto the left page either creating complete double-page spreads or partial ones where a third of the page is filled with illustration. The paper is cream, thick and very lightly textured, it doesn’t bleed with water-based pens but will bleed with alcohol markers so make sure you pop a protective sheet behind your work. Pencils go on smoothly but oil-based pencils can be a little tricky to blend and layer due to lack of tooth, experienced colourists will manage to get stunning results though I’m sure and my Prismacolor Premiers worked very well. The images themselves are a great mix of adult level colouring but with childlike charm. The illustrations tell the story of Vivi as she goes in search of a friend and she travels to different environments and meets different creatures which means you’re offered a huge variety of things to colour from practising skin tones and fur to feathers and clouds, if you want a book to challenge you out of your comfort zone then this is ideal. Equally though, this would look gorgeous block coloured or with minimal blending and shading, or with a touch of added sparkle from some glitter gel pens so don’t be put off if you’ve not mastered fur, I haven’t yet but I’ve given it a go in this book. A few of the images have dots on to indicate shading and these are very useful, especially for beginner colourists to learn where light and shade can be placed in an image. As with Maria’s other books, a total of 8 images have a black background which is a lovely touch and will make the colours really pop on those pages. There are almost 50 images which are really varied in content and there is a beautiful map at the back showing all of the different places Vivi travels to within the story. In terms of mental health, this book is wonderful, the storytelling aspect is lovely because it offers escapism and Maria’s images are so evocative and charming that you can’t help but become immersed in Vivi’s world and your worries and symptoms soon melt away. The childlike quality of the images is very nostalgic and really transports you back to simpler times and happy days as a child. The line thickness is consistent throughout and is thin. The intricacy and detail levels vary from large open spaces of a fox or whale to much smaller details of leaves, flower centres and butterflies, and everything in between. You will need fairly good vision and fine motor control to keep within the lines but they don’t need to be perfect so don’t be put off, just check the images below to decide if they’re suitable or not. This book offers a huge amount of scope for the imagination, while the pictures do tell the story very well, you could easily add your own written story on the blank left-hand pages throughout the book and once coloured you could gift it to a child or read it to your own children. You could even colour Vivi to look like a little girl you know and get her to wear their favourite colour so that it’s like that child is in the story, this would make the most wonderful personalised gift! The variance in image content means that this book is ideal for those with fluctuating conditions and concentration levels, on bad days you can colour just one cloud or acorn and on better days you could colour a whole image, there are loads of natural stopping points so you can get the satisfaction of finishing something without it having to be the entire page which can often be quite daunting and off-putting! This book really is another beautiful creation which is exactly what we’ve come to expect from Maria, it’s a really different premise from most adult colouring books but I personally love it and even though I don’t have children myself, or really anyone to gift it to, I’m still loving colouring in it and imagining myself on Vivi’s journey as she meets cloud bears, mermaids and woodland creatures. Overall, I would highly recommend this book, it offers so much escapism and the artwork is just charming. It would make a wonderful gift fully coloured, with a written story added, or even a framed page and Vivi is sure to become a family favourite! Droomreis has glue and string-bound pages which are non-perforated, Vivi Söker en Vän has glue and string-bound pages which are perforated and therefore removable. The paper is the same colour in both books and is a creamy off-white colour, it is thicker and almost card-like in Vivi Söker en Vän and the paper in the Dutch edition seems identical to the paper used in the majority of Swedish books. The language throughout the book, including all text in images has been changed from Swedish to Dutch. A few of the images in Droomreis are double-page spreads or partial double-page spreads where the image reaches across some of the left page, these images are all single pages in Vivi Söker en Vän so you do get a few unseen pages to colour in Droomreis and some of the single page spreads in Vivi have been slightly re-jigged to include a bit more content (see photos below for comparisons). The front and back cover and the text on the spine of Droomreis has gold foiling accents, Vivi Söker en Vän has no gold foiling. The covers are completely different and both depict different internal images that are partially coloured. Droomreis is slightly larger than Vivi but the pages inside the covers are a little smaller overall. If you’d like to purchase a copy of the book it’s available below though it is often out of stock on Book Depository so you may want to sign up for email alerts with them so you know as soon as it’s available again! The image below was coloured using Prismacolor Premier Colored Pencils. Press Out and Colour: Butterflies, is published and very kindly sent to me to review by Nosy Crow. This book is aimed at children but actually, it’s ideal for anyone who’s young at heart and I really enjoyed colouring my butterfly ready for the review. This book is hardback, a little larger than A5 and spiral-bound. The covers are bright blue and the spine is pink with silver foiling on the spine and the front cover. On the inside covers are white line drawings on a pink background showing 5 of the butterflies fully assembled and named on each. The book contains 10 models of butterflies which you can press out (before or after colouring), colour and assemble and then hang around the house. The pages are made of very thick card/hardboard and are covered in silver foil throughout. The butterflies are white with silver line-drawn patterns all over them which you colour within and these catch the light beautifully when you hang up your assembled butterfly and it moves against the light. The butterflies are printed double-sided, they’re designed to look like real butterflies so some have the same design printed on the top and underside and others have different tops and undersides like their real counterparts thus making them look more realistic when hung up. The cuts around the little sections that need to be removed in order to slot the butterfly together and hang it up are really well cut so that you can push the unneeded bits out with your fingers or something a bit pointier if needed. The pieces slot together really well and are very sturdy and will remain so if you don’t disassemble and reassemble them a lot so they won’t fall apart by accident and they shouldn’t need gluing. Each butterfly has a small hole in the centre of each wing so that you can tie some thread through (the hole is a little small for string) and you could either hang the butterflies separately or together, or even create a mobile or ceiling centrepiece. If you don’t want to keep the butterflies hung up then they can be disassembled and the pieces can be popped back into the guides in the book for safekeeping. The guides can also be used as stencils to draw within (or you could draw around the pieces but be careful to only use pencil so you don’t accidentally damage your finished butterfly) so that you can create kaleidoscopes more than the original 10 you’re getting. Simply draw within the slots and holes on the pieces to make sure it’ll slot together just like the original or, if you’re using thinner card, make them thinner and adjust with scissors as you go if it’s a bit too tight a fit! The butterflies included are: Blue Morpho, Buckeye, Lime, Monarch, Painted Lady, Peacock, Pearl-Bordered Fritillary, Red Admiral, Tiger Swallowtail, and Zebra Longwing. As mentioned before, the card is very thick hardboard and therefore you can use whatever mediums you fancy. I used alcohol markers on mine as they’re much more fade-resistant than water-based pens and they didn’t shadow at all. The patterns are quite detailed so you may struggle with pencils and little people almost certainly would so I’d stick to pens for this (do put down some protective stuff on the table if letting your child loose with Sharpies or it may not just be the butterfly that gets permanently subjected to their creative flair). These butterflies would make a perfect family project, you could do one each or even do a piece each and see what you come out with, I’m sure you could create some stunning butterflies! It would be a lovely activity to do for or with your children and once you’ve completed all 10 you could hang them at different heights in their bedroom so that you and they are constantly reminded of the fun you had creating them together. The hardboard is really durable and will hold up to a fair bit of bashing, scrubbing, and over-colouring (children can get a little over-enthusiastic with pens sometimes) so these butterflies would be ideal for children of almost any age, if they can hold a pen and colour, they can colour these butterflies! The parts are all fairly big so it’s advised on the book that you don’t give it to a child under the age of 36 months but above that you’ll be good to go! In terms of mental health, what could be better than an activity that you can share with your children? The process of colouring them together will be sure to lift your mood and if you’re ever having a bad day or feeling anxious, go and check out your handiwork and lie on the floor gazing up at the masterpieces you and your children have created and imagine you’re a butterfly fluttering through the sky and away from your problems; it can’t just be me who’s always wished they could fly?! The intricacy and detail level is surprisingly high for a book that’s aimed at children but the silver lines can either be coloured within by adults, or over by children, it really won’t matter either way and you’ll get some very unique butterflies regardless of the way you colour them. If you want the butterflies to look realistic then you could find some images of the butterfly to show your child so they can have a go at matching it or you can let their creativity loose and have a multitude of rainbow butterflies. All of the butterflies are made of 2 pieces so they’re really easy to assemble and they don’t take hours and hours to colour, even if you do colour each section separately (like I did) so they’re a great quick project to create something beautiful and displayable for your home! I would highly recommend this book to those with children, or the young at heart. These butterflies are super cute and great fun to colour and they look even better once assembled, a fully coloured kaleidoscope of them hung up in a room will look fabulous and be sure to delight your child and brighten up the darkest of days be those due to weather or mental health. Get colouring yourself a kaleidoscope of butterflies! The butterfly below was coloured using Sharpies. Press Out and Colour: Easter Eggs, is published and very kindly sent to me to review by Nosy Crow. This book is aimed at children but actually, it’s ideal for anyone who’s young at heart and I really enjoyed colouring my Easter Eggs ready for the review. This book is hardback, a little larger than A5 and spiral-bound. The covers are bright yellow and the spine is pale blue with gold foiling on the spine and the front cover. On the inside covers are white line drawings on a bright blue background of Easter egg decorations hung on branches. The book contains 20 different sizes of Easter eggs, some of which are flat and some of which slot together to make a 3D shape all of which you can press out (before or after colouring), colour and assemble and then hang around the house. The pages are made of very thick card/hardboard and are covered in gold foil throughout. The Easter eggs are white with gold line-drawn patterns all over them which you colour within and these catch the light beautifully when you hang up your assembled egg and it moves against the light. The eggs are printed double-sided with the same design on both sides so that you can colour it identically and have a 3D egg at the end. The cuts around the little sections that need to be removed in order to slot the egg shapes together and hang it up are really well cut so that you can push the unneeded bits out with your fingers or something a bit pointier if needed. The pieces slot together really well and are very sturdy and will remain so if you don’t disassemble and reassemble them a lot so they won’t fall apart by accident and they shouldn’t need gluing. Each egg has small holes that you can tie some thread through (the holes are a little small for string) and you could either hang the eggs separately or together, or even create an Easter tree out of foraged branches. You may not want to keep these egg decorations up all year round and if that’s the case then they can be disassembled and the pieces can be popped back into the guides in the book for safekeeping. The guides can also be used as stencils to draw within (or you could draw around the pieces but be careful to only use pencil so you don’t accidentally damage your finished piece) so that you can create lots more eggs than the original 20 you’re getting. Simply draw within the slots and holes on the pieces to make sure it’ll slot together just like the original or, if you’re using thinner card, make them thinner and adjust with scissors as you go if it’s a bit too tight a fit! The eggs are in 4 different sizes: 6 of the largest which are all 3D; 2 of the second largest which are also both 3D; 8 of the second smallest which are flat in design and 4 of the smallest which are also flat in design. Once they’re all coloured, assembled, and displayed together they’ll look fabulous and you’ll be all set for the Easter Bunny’s arrival in April. As mentioned before, the card is very thick hardboard and therefore you can use whatever mediums you fancy. I used alcohol markers on mine as they’re much more fade-resistant than water-based pens and they didn’t shadow at all. The patterns are quite detailed so you may struggle with pencils and little people almost certainly would so I’d stick to pens for this (do put down some protective stuff on the table if letting your child loose with Sharpies or it may not just be the egg that gets permanently subjected to their creative flair). These egg decorations would make a perfect family project, you could do one each or even do a piece each and see what you come out with, I’m sure you could create some really wonderful decorations! It would be a lovely activity to do for or with your children and once you’ve completed all 20, or just a few, you could hang them around the house or on an Easter tree in pride of place so that you and they are constantly reminded of the fun you had creating them together. The hardboard is really durable and will hold up to a fair bit of bashing, scrubbing, and over-colouring (children can get a little over-enthusiastic with pens sometimes) so these eggs would be ideal for children of almost any age, if they can hold a pen and colour, they can colour these decorations! The parts are all fairly big so it’s advised on the book that you don’t give it to a child under the age of 36 months but above that you’ll be good to go! In terms of mental health, what could be better than an activity that you can share with your children? The process of colouring them together will be sure to lift your mood and if you’re ever having a bad day or feeling anxious, go and check out your handiwork and marvel at the gorgeous colours and look forward to the chocolate treats you’ll be sharing with each other soon! The intricacy and detail level is surprisingly high for a book that’s aimed at children but the gold lines can either be coloured within by adults, or over by children, it really won’t matter either way and you’ll get some very unique egg decorations regardless of the way you colour them. Each egg either has a pattern or Spring-themed scene on it so none of it needs to be coloured realistically and you could either theme them all with a Spring palette or just let loose with ALL the colours! Each egg is either made of one or two pieces so some need no assembly and those that do just require slotting one piece into the other so they’re really easy to assemble and they don’t take hours and hours to colour, even if you do colour each section separately (like I did) so they’re a great quick project to create something beautiful and displayable for your home! I would highly recommend this book to those with children, or the young at heart. These egg decorations are super cute and great fun to colour and they look even better once assembled, a fully coloured set will look “eggcellent” (not even sorry!) hung up in a room or adorning an Easter tree and they’ll be sure to delight your child and brighten up the darkest of days be those due to weather or mental health. Get colouring yourself some “eggstra”-special egg decorations! The eggs below were coloured using Sharpies. Magisk Gryning 20 Vykort are illustrated by Hanna Karlzon, and published and kindly sent to me to review by Pagina Förlag. These postcards are taken from Hanna’s original colouring book Magisk Gryning/Magical Dawn (reviewed by me here), there is also an artist’s edition available. This postcard book contains 20 postcards, it’s paperback with thick card covers and a black tape binding. The cover is the same colour and design as the original book but printed on a smaller scale with the same luxurious gold foil accents. The book has a lay flat binding meaning there is no spine to contend with so you’re able to reach and colour the entirety of the image; the postcards are easy to remove if you wish so they can be sent or gifted or even framed but they’ll stay in the book as long as you’re careful not to twist the spine. The cards are a cream colour which looks quite vintage, it’s fairly smooth with a light texture and is perfect for blending and shading with pencils but pens glide over it seamlessly too. Alcohol markers won’t bleed if you’re careful and they don’t spread, they do shadow onto the reverse so bear this in mind if you’re wanting to write on the back. The postcards are printed single-sided and on the reverse are printed three address lines and space for a stamp with a little star motif within it. The drawings mostly have a small border around them but 6 are full page, they will be pretty easy to frame if you wish to do so. The illustrations are all very similar to those used in the Daydreams and Winter Dreams postcard sets in terms of intricacy level and content, none are impossible to colour and all will look beautiful when finished. The images are mostly nature-based but a number of them are magic-themed and for the second time Hanna has included female drawings, four have been included this time which is a lovely addition. There aren’t a lot of gems in this selection but the illustrations do contain a really good variety of things from birds to potion bottles, jewellery to cats, females to sand timers and beetles to flowers, this postcard set possibly contains the widest ranging content of all of Hanna’s postcards. They’ve all got a bit of added whimsy and fantasy which is a huge part of what gives Hanna’s images such charm and sets them apart from others, they’re just beautiful, even without colour added! In terms of mental health, these postcards are just perfect! Postcards offer a smaller project which is less daunting to start and takes far less time to make progress on or finish than a full book page. The card is ideal for using any mediums and because they’re single-sided they’re perfect for framing so you can brighten up your darker days by just looking at all of the wonderful pages you’ve created, a great way of lifting your spirits. These postcards are fantasy-based which means they offer great escapism and distraction from difficult thoughts or symptoms, Hanna’s images really absorb you and transport you to far off lands and magical places. Fantasy images are great for those of you who don’t like being restricted with colour schemes and they’re a good challenge for those of you who like to colour things realistically as you can really let your hair down and use any colours you fancy for feline princesses or crystal mushrooms, there’s no right or wrong colour scheme and often the more vibrant and outlandish you go, the better the results! The line thickness is consistently thin throughout but it’s not spindly thin. The intricacy and detail levels are pretty high but none of the spaces are impossible to colour. You will need fairly good vision and fine motor control to get the most out of these postcards. As for concentration level, these pages are ideal because their smaller size means they take less concentration and you can focus on individual aspects if you prefer and colour just one gem or potion bottle rather than focusing on the whole picture at once. These postcards are ideal for good and bad days, they’re a manageable size and I personally find them very inspiring and easy to get into without having to stress over colours for hours, I can just dive right in. If you need any inspiration then just search online using Hanna’s name or the book title and you’ll find heaps of ideas to get you going! Overall, I would highly recommend these postcards, they’re all beautifully illustrated and they’re perfect for days when you’re feeling poorly, down, or your concentration is waning. They make an ideal project to send to others, to frame, or to keep in the book and they’re truly beautiful even just to look through uncoloured! They are a great format for Hanna’s drawings and even if you have the original colouring book, it doesn’t feel samey or stale despite containing the same imagery, the change in scale somehow makes the artwork seem different and lends itself to different colour schemes and the use of different mediums and techniques. The image below was coloured using Sharpie Fine Point Alcohol Markers and a few Promarker Alcohol Markers and the white highlights were added using a White Sakura Gelly Roll Gel Pen. Vinternatt Postcards are illustrated by Hanna Karlzon, and published and kindly sent to me to review by Pagina Förlag. These postcards are not taken from a book and have been published as a standalone postcard set and Hanna has categorically stated that there are no plans to turn these, or her other winter-themed postcard set, Vinterdrommar/Winter Dreams, into a full length colouring book. This postcard book contains 20 postcards, it’s paperback with thick card covers and a black tape binding. The cover is a pale blue with an illustration from inside the book with beautiful silver foiling accents and writing on the spine. The book has a lay flat binding meaning there is no spine to contend with so you’re able to reach and colour the entirety of the image; the postcards are easy to remove if you wish so they can be sent or gifted or even framed but they’ll stay in the book as long as you’re careful not to twist the spine. The cards are a cream colour which looks quite vintage, it’s fairly smooth with a light texture and is perfect for blending and shading with pencils but pens glide over it seamlessly too. Alcohol markers won’t bleed if you’re careful and they don’t spread, they do shadow onto the reverse so bear this in mind if you’re wanting to write on the back. The postcards are printed single-sided and on the reverse are printed three address lines and space for a stamp with little star doodles within it. The drawings mostly have a small border around them but 4 are full page, they will be pretty easy to frame if you wish to do so. The illustrations are all very similar to those used in the Daydreams and Winter Dreams postcard sets in terms of intricacy level and content, none are impossible to colour and all will look beautiful when finished. The images are very nature-based and for the first time in a postcard set two of Hanna’s female drawings have been included which is a lovely addition. There are a good number of gems which many of you will know I’m a huge fan of colouring and the illustrations also include lots of birds, stars, a cat, candles, a crown, a beautiful house, lanterns, a beetle and more. They’ve all got a bit of added whimsy and fantasy which is a huge part of what gives Hanna’s images such charm and sets them apart from others. These images are all winter themed with a real Nordic style to them, there’s nothing Christmas-themed in this book and if you’re looking for that then I’d recommend the Vinterdrommar/Winter Dreams set, this set is very bird and star heavy and it’s really ornate and highly decorated. In terms of mental health, these postcards are just perfect! Postcards offer a smaller project which is less daunting to start and takes far less time to make progress on or finish than a full book page. The card is ideal for using any mediums and because they’re single-sided they’re perfect for framing so you can brighten up your darker days by just looking at all of the wonderful pages you’ve created, a great way of lifting your spirits. These postcards are nature-based and I find this the best thing for mental health as they’re very calming and peaceful and if you struggle to conjure up colour palette ideas you can just go with the one nature already created or spice things up a little if you’re feeling brave. The line thickness is consistently thin throughout but it’s not spindly thin. The intricacy and detail levels are pretty high but none of the spaces are impossible to colour. You will need fairly good vision and fine motor control to get the most out of these postcards. As for concentration level, these pages are ideal because their smaller size means they take less concentration and you can focus on individual aspects if you prefer and colour just one star or bird rather than focusing on the whole picture at once. These postcards are ideal for good and bad days, they’re a manageable size and I personally find them very inspiring and easy to get into without having to stress over colours for hours, I can just dive right in. If you need any inspiration then just search online using Hanna’s name or the book title and you’ll find heaps of ideas to get you going! Overall, I would highly recommend these postcards, they’re all beautifully illustrated and they’re perfect for days when you’re feeling poorly, down, or your concentration is waning. They make an ideal project to send to others, to frame, or to keep in the book and they’re truly beautiful even just to look through uncoloured! The image below was coloured using Holbein Artists’ Colored Pencils, the background was coloured using a black Sharpie and the white highlights were added using a White Sakura Gelly Roll Gel Pen. Vivi Söker en Vän Målarbok, which translates into English as Vivi’s Looking for a Friend, is illustrated by Maria Trolle, who has also illustrated Blomstermandala and I Bring You Flowers Postcards, and is published and kindly sent to me to review by Pagina Förlag. This book is Swedish and currently only published there, it’s available for International purchase using the links at the bottom of this review just above the photos. Maria has created a children’s story book with these illustrations in full colour and an adult’s colouring book (reviewed here) where the story is removed. Maria has posted a short description of the story on her Facebook page which I’ve quoted directly below. The book itself is 21.5 x 25.4cm, it’s paperback with a partially coloured image from inside on the cover (the storybook has a fully coloured image on the front so be sure you’re ordering the correct one) wrapped around both flexible card covers, there are small colourable images from inside the book on the insides of both covers. The spine is glue and string bound so it’s very durable but a little tricky to get the book to lie flat at first. The pages are printed single-sided onto perforated pages which are sturdy enough to hold them in the book if you wish to keep it complete, but these do allow you to remove pages before or after colouring if you wish. The paper is cream, thick and very lightly textured, it doesn’t bleed with water-based pens but does bleed with alcohol markers so make sure you pop a protective sheet behind your work. Pencils go on smoothly but are a little tricky to blend and layer due to lack of tooth, experienced colourists will manage to get stunning results though I’m sure! The images themselves are a great mix of adult level colouring but with childlike charm. The illustrations tell the story of Vivi as she goes in search of a friend and she travels to different environments and meets different creatures which means you’re offered a huge variety of things to colour from practising skin tones and fur to feathers and clouds, if you want a book to challenge you out of your comfort zone then this is ideal. Equally though, this would look gorgeous block coloured or with minimal blending and shading, or with a touch of added sparkle from some glitter gel pens so don’t be put off if you’ve not mastered fur, I haven’t yet but I’ll be giving it a go in this book. A few of the images have dots on to indicate shading and these are very useful, especially for beginner colourists to learn where light and shade can be placed in an image. As with Maria’s other books, a total of 8 images have a black background which is a lovely touch and will make the colours really pop on those pages. There are almost 50 images which are really varied in content and there is a beautiful map at the back showing all of the different places Vivi travels to within the story. In terms of mental health, this book is wonderful, the storytelling aspect is lovely because it offers escapism and Maria’s images are so evocative and charming that you can’t help but become immersed in Vivi’s world and your worries and symptoms soon melt away. The childlike quality of the images is very nostalgic and really transports you back to simpler times and happy days as a child. The line thickness is consistent throughout and is thin. The intricacy and detail levels vary from large open spaces of a fox or whale to much smaller details of leaves, flower centres and butterflies, and everything in between. You will need fairly good vision and fine motor control to keep within the lines but they don’t need to be perfect so don’t be put off, just check the images below to decide if they’re suitable or not. This book offers a huge amount of scope for the imagination, while the pictures do tell the story very well, you could easily add your own written story on the blank left-hand pages throughout the book and once coloured you could gift it to a child or read it to your own children. You could even colour Vivi to look like a little girl you know and get her to wear their favourite colour so that it’s like that child is in the story, this would make the most wonderful personalised gift! Equally, you could remove the pages and frame them for a child’s bedroom, they’d be a wonderful addition with their whimsical content. The variance in image content means that this book is ideal for those with fluctuating conditions and concentration levels, on bad days you can colour just one cloud or acorn and on better days you could colour a whole image, there are loads of natural stopping points so you can get the satisfaction of finishing something without it having to be the entire page which can often be quite daunting and off-putting! This book really is another beautiful creation which is exactly what we’ve come to expect from Maria, it’s a really different premise from most adult colouring books but I personally love it and even though I don’t have children myself, or really anyone to gift it to, I’m still loving colouring in it and imagining myself on Vivi’s journey as she meets cloud bears, mermaids and woodland creatures. If you’d like to purchase a copy it’s available to order below though you may need to be patient as it’s very popular and often out of stock. The image below was coloured using Sharpie Fine Point Alcohol Markers. Fåglar & Fjärilar is illustrated by Nadja Wedin, and published and kindly sent to me to review by Pagina Förlag. This is another beautiful Swedish offering which is currently only available from international websites (links below, directly above the photos). This book is landscape, measuring 29x20cm, paperback, with thick flexible card covers with partially coloured images on the front and back covers which are featured within the book. It has gold foiling on the title and matte gold tape covering the spine which has a lay-flat binding meaning the book will lie completely flat and that the pages can be removed if you wish, this also means you need to be careful not to twist the spine to avoid pages accidentally falling out. The book contains 20 single-sided images and every other one has a black background, the last 6 pages are the same 3 images printed first with a black background and second with a white background, the other 14 pages in the book are all different images. The pages are a pale cream colour, made of thick card and are lightly textured, water-based pens don’t bleed or shadow, alcohol markers do bleed to the back of the page but not through onto the next as the card is so thick. Pencils apply smoothly but are a tad tricky to layer at points due to lack of tooth, it is manageable though and I’ve seen some beautiful finished pages done in pencil so do persevere. The images themselves are exactly as you’d expect given the translation of the title, the pages are filled with birds and butterflies, as well as berries, flowers, leaves, trees, cats, hedgehogs, pine martens, and heaps more. Some of the images are scenes and others are a bit more like a random collection of items all pictured on the same page. 7 of the images are portrait, the other 13 are landscape. A few elements of some of the images are drawn in a greyscale style where they’re not just black and white line drawings, they have lots of shading and texture added in the form of fur on a few of the animals, this is quite unobtrusive and is fantastic for those of us who’ve not yet mastered colouring realistic fur! In terms of mental health, this is a lovely book and because it’s nature-based it’s great for calming you down. The imagery is almost like walking through a garden and this is great for those who are housebound like I am, one of the things I miss most is being outside watching the birds and looking at flowers and this book really offers up a sense of those things. The line thickness is consistent throughout the book with thin lines and some spindly thin details. The intricacy and detail levels are varied within each image and range from very small details all the way up to much larger open spaces, the majority are small so you will need reasonable vision and fine motor control to enjoy this book. The images are all made of lots of component parts which is ideal for those of you with concentration problems of fluctuating conditions, you can colour just one or two items at once or colour all of one type of flower, or berry, or more on a better day. There is plenty to look at on each page so it’s very absorbing and you do need to focus well in order to decipher what each section is to ensure you’re colouring things the correct colour. These illustrations look truly stunning when they’re completed in a number of mediums and they are absolutely worthy of framing which means the removable pages are ideal. You could display your completed creations in your home to brighten things up and remind you on bad days of exactly how much you can achieve, or they would make a stunning and very personal gift, if you can bear to part with any! Overall, this is a beautiful nature-themed book which really does take you on a walk through a garden of birds and butterflies. The black and white background pages are lovely and the card is great for just about any medium and when you’re done you can frame your creations and show off all your beautiful hard work. What could be better?! If you need some inspiration or want to see some more coloured pages then check out this lovely Facebook Fan Group. The page below was coloured using Sharpie Fine Point Alcohol Markers. Pukka Pad A4 Colour In and Personalise Project Book is part of the Pukka Pad stationery range and was kindly sent to me to review. This notebook is A4 in size and exactly the same size, shape and format as their standard project notebooks with spiral-binding, thick flexible card covers, and 5 differently coloured plastic pocket divider pages with tabs that can be written on to label each section (the colours of these are black, bright pink, yellowy-green, pale pink and lilac). All of the pages are lined with the usual thickness lines of this style of notebook. What makes this project book different is the 6 sides of covers that you can colour. At the front of the book are two double-sided card covers each with a different design on, the front of each has the Pukka Pad logo on, coloured in pink on the first, and left blank on the second, the inside covers of each are still uniquely designed and these don’t have the wording on them. The back cover is identical to the two designs on the first of the front covers so you get 6 A4 sides to colour with a total of 4 unique designs. The card the covers are printed on is very thick and one side is quite shiny and the other matte, both textures are equally easy to colour on with alcohol markers and I experienced no bleed-through or shadowing when using either side so you’ll be able to colour all 6 covers using alcohol markers if you wish. The matte sides will be fine to use water-based pens on or pencils if you wish, but the shiny sides are only really suitable for alcohol markers as the surface repels water-based inks. At the bottom of each notebook page is a doodle bar with the same pattern repeating throughout the book, I personally found this a shame because I’m not overly keen on colouring the same pattern 200 times, it would have been better to have them all different if possible or at least alternating between a few designs. The paper is standard notebook paper so it’s relatively thin at 80gsm and sadly, water-based pens do noticeably shadow when colouring the doodle bar on each page. When writing, there is a little shadowing but this is standard throughout most notebooks of this type. The doodle bar itself is a simple mosaic style floral pattern which certainly has lots of scope for different colour palettes, you could challenge yourself to do a different one for each of the 200 copies! The covers are a good variety of images with one being butterflies (2 copies), one repeated flower designs, one the mosaic style floral pattern shown much larger and in full (2 copies), and one a floral, circular, scaly type pattern. In terms of mental health, this notebook doesn’t offer a huge amount of colouring so as a specific colouring product it’s not ideal, however, as a notebook, that you might need to be using anyway, with added colouring to do, it’s a really nice product and it’ll be really handy for giving you a quick colouring fix. When I was at uni and sat in lectures I’d often draw heaps of simple shapes and then colour them in, it helped me concentrate and stay focused, I wish colouring notebooks had existed at the time because not only would I have had space to write lecture notes but I could also have coloured in without having to look like a teenager with a ridiculous crush by drawing and colouring in hearts all over my book because I couldn’t draw anything else. The line thickness varies across and throughout the images from spindly thin to medium thickness, the intricacy and detail levels vary hugely too from teeny tiny spaces to larger open spaces, you will need pretty good vision and fine motor control but it doesn’t need to be perfect and you could easily do what I did and colour over some of the small sections or background patterns. The doodle strips on each page won’t take you long to colour at all which is ideal for colouring on the go and colouring on bad days, you could colour all of the covers ready for using the notebook for a new term or semester, or you could colour as you go and just fill in sections when you fancy. This notebook once finished will look fabulous and be really personal and it’s sure to brighten up your day and make dull lecture notes a bit more exciting. Overall, I would highly recommend this project book. There’s not a huge amount of different imagery to colour which is a bit of a shame but it’s nicely produced and the images included are very nice, the project book itself is great as always from Pukka Pad! The cover below was coloured using Sharpie Fine Point Alcohol Markers, the notebook page was coloured using Stabilo Point 88 Fineliners.